by Leon I. Hammer, M.D. 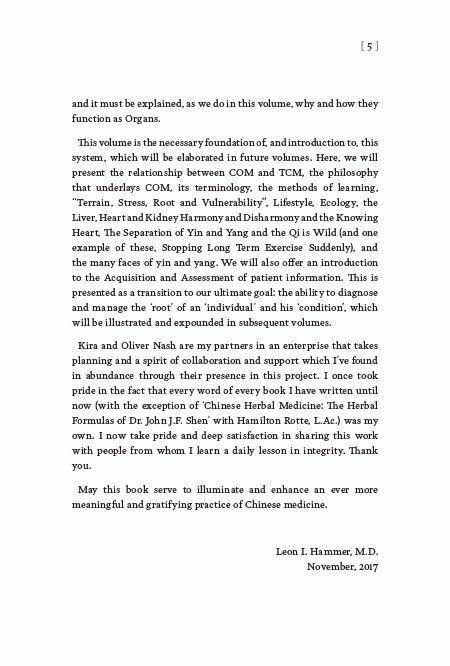 Contemporary Oriental Medicine: Concepts is a bold new volume by the acclaimed master of Chinese Medicine, Dr. Leon Hammer, M.D. The culmination of over sixty years’ experience, Concepts represents a lifetime of work, study, and devotion to the search for a true path to healing. 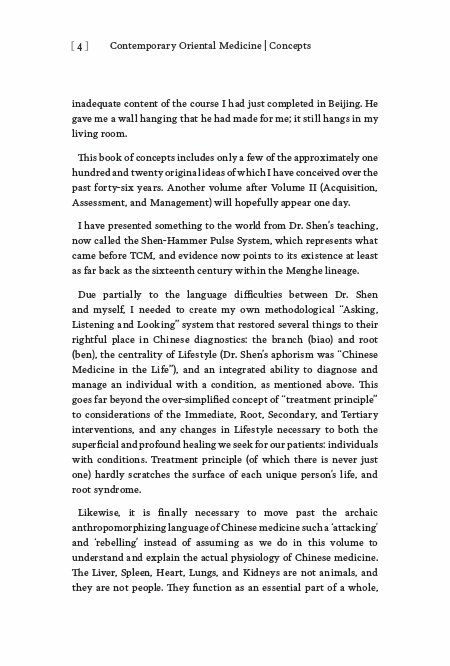 Following on from the teachings of his mentor, Dr. John H.F. Shen, Dr. Hammer presents an evolved and updated understanding of the medicine of the renowned Menghe-Ding lineage of Chinese Medicine, of which he is now a successor. Concepts is much more than a practical manual, although it is brimming with valuable clinical advice. It also presents a new philosophy: a new way of looking at medicine, and at the world in which we live. Contemporary Oriental Medicine is about so much more than just where to insert needles, or which herbs to prescribe. Rather, it represents a paradigm shift in healing and awareness, giving both patients and practitioners the tools they need to enact real recovery, and change their lives for the better. Exploring, among other subjects, theories on Ecology, ‘Terrain, Stress, Root, and Vulnerability’, the vital role of the Liver in Chinese Medicine, the critical importance of Lifestyle as a cause and resolution of disease, and Dr. Hammer’s remarkable insight into the ‘Separation of Yin and Yang’ and ‘Qi Wild’ as disease processes throughout life, this book brings together, for the first time, the truly outstanding body of work that constitutes the main tenets of Contemporary Oriental Medicine. A rewarding read and an essential addition to the libraries of practitioners and students alike, Contemporary Oriental Medicine: Concepts will change the modern world of Chinese medicine. Dr. Leon I. Hammer, M.D. has had a remarkable life and career. Born in 1924 in New York City, he served in the United States military during and after World War Two as a Navigator, Aerial Gunner, Captain and Physician. He attended Cornell University and Cornell Medical College, and went on to study at the William A. White Institute of Psychoanalysis and Psychiatry. Until 1971, he practiced psychiatry and psychoanalysis, directed a child guidance clinic and Drug Abuse Councils on the Southeast Shore of Long Island, taught at Adelphi University, and was Psychiatric Consultant and Associate Professor at Southampton College in Southampton, New York. After working with Fritz Perls and Gestalt therapy for three years, and with Alexander Lowen and Bioenergetics over a period of eight years, he began a study of Chinese medicine in 1971. For the next three years, he studied in England with Dr. J.D. van Buren. In 1974, he began a twenty-seven year-long apprenticeship with Dr. John H.F. Shen, a Chinese Master in New York City. During this time, Dr. Hammer spent four months studying in Beijing, China. His time with Dr. Shen had a huge influence on his work, eventually leading him to develop what has become Contemporary Oriental Medicine. In 1975, Dr. Hammer achieved certification to practice acupuncture in New York State, and later also became a registered acupuncturist in Maryland, where he studied and taught at the Traditional Acupuncture Institute. In 1985 he was granted honorary ‘Diplomate in Acupuncture’ status by the NCCA. Dr. Hammer has practiced Chinese medicine since 1973, and has lectured and all over the world. He served as a member of the Commission for Evaluation of Acupuncture Schools, and was appointed a member of the National Blue Ribbon Committee for Initiation of the Herbal Examination. From 1991 through 1998, he was a member of the New York State Board of Acupuncture. In 2001, Dr. Hammer received an award as “Educator of the Year” for participation and contribution to excellence in education from the American Association of Oriental Medicine. In 2002, he received an award from the Traditional Chinese Medicine Foundation for “Building Bridges of Integration” between Oriental and Western medicines. In April 2001, Dr. Hammer helped found Dragon Rises College of Oriental Medicine in Gainesville, Florida, and served as Chairman of the Board and as a faculty member. The school is distinguished not only by its strong focus on diagnosis, especially Contemporary Chinese pulse, but also by its Contemporary Oriental Medicine curriculum. The College is accredited by the National Accreditation Commission for Acupuncture and Oriental medicine, and licensed by the state of Florida to grant Master’s degrees in acupuncture and Oriental Medicine. Dr. Hammer was first published on the subject of Chinese medicine in the American Journal of Acupuncture in 1980, and subsequently has written numerous articles on a range of subjects within the medical field. His first book, Dragon Rises, Red Bird Flies (Eastland Press, 1990) was also translated and published in Germany and Spain, has become a classic in the field. His second book, Chinese Pulse Diagnosis, A Contemporary Approach (Eastland Press, 2001), has been described as a seminal work. In 2008 his third book was published: The Patient-Practitioner Relationship in Acupuncture (Thieme). 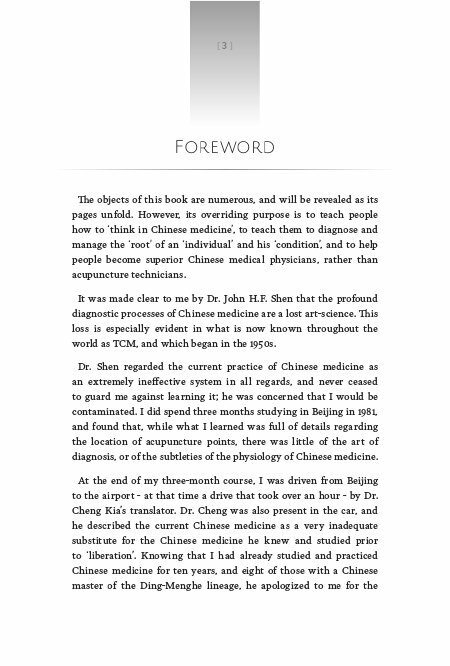 He has written a compendium of the herbal formulae of Dr. John H.F. Shen (Thieme, 2012, with Hamilton Rotte), and in 2012 Eastland Press published Dr. Hammer’s The Handbook of Contemporary Chinese Pulse Diagnosis. He has a great love of nature and ecology, and a passion for ensuring that all creatures are treated with equal respect and compassion. Dr. Hammer greatly enjoys sailing, kayaking, cross-country skiing, and tennis, although sometimes he is happiest just sitting and watching the birds, trees and mountains from his window. He is married with children and grandchildren, and currently lives in Florida.